Dimensions 0.50 by 6.75 by 8.25 in. Amazon.com description: Product Description: In this indispensable volume of kitchen wisdom, Julia Child gives home cooks the answers to their most pressing kitchen questions. How many minutes should you cook green beans? What are the right proportions for a vinaigrette? How do you skim off fat? What is the perfect way to roast a chicken? Here Julia provides solutions for these and many other everyday cooking queries. How are you going to cook that small rib steak you brought home? You'll be guided to the quick sautÃ© as the best and fastest way. And once you've mastered that recipe, you can apply the technique to chops, chicken, or fish, following Julia's careful guidelines. 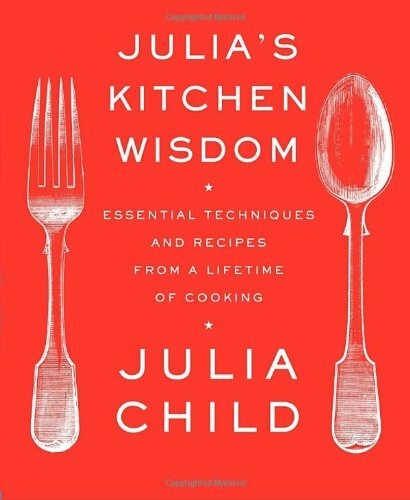 Juliaâs Kitchen Wisdom is packed with essential information about soups, vegetables, and eggs, for baking breads and tarts, and more, making it a perfect compendium of a lifetime spent cooking. About: Provides basic recipes for soups, sauces, salads, dressings, vegetables, main dishes, eggs, and baked goods, along with variations and tips on kitchen techniques for each type of dish. About: Provides basic recipes for soups, sauces, salads, dressings, vegetables, main dishes, and baked goods, along with variations and tips on kitchen techniques for each type of dish. About: In this indispensable volume of kitchen wisdom, Julia Child gives home cooks the answers to their most pressing kitchen questions.